Not only is Beat-the-Clock a handy motivational/discipline technique for young children, it is also a game I seem to play every morning as I try to get out the door to go to work. It would be great if I could leave the house by 7:45. That way, even on bad traffic days, chances are pretty decent that I'd make it to the office by 8:30. But this very rarely (i.e. practically never) happens. Fortunately, we have flexible working hours at my office. But I always wish that I could leave the house sooner so that traffic would be better so that I could finish work earlier so I could be at home in time to make dinner without rushing so I could relax a little and enjoy spending some time with the kids. I've tried getting up earlier. I've tried getting myself ready first. I've tried getting the girls ready first. I've tried showering first while my hubby helps with the girls. I've tried helping with the girls while he showers first. I've tried leaving breakfast completely to the nanny. I've tried having the girls fed before she arrives. I already skip breakfast at home and wait to eat at the office. I usually pack my breakfast, lunch, and snacks before I go to bed. I shower fast. I don't wear make-up, except for a smidgeon of lipstick that I put on at my desk. My hair is low maintenance, and I sometimes forget to wear jewellery. None of this seems to make a difference. Three little girls who have hair that needs brushing and styling, and three little girls who usually resist. At least two little girls who need help brushing their teeth. At least one little girl who needs help getting dressed. My irrational need to have the beds made and dirty clothes put into the hamper. A nanny who, instead of coming in and helping me finish getting breakfast for the girls, sits down at the table and seems to spend at least 5 minutes telling me about the bus driver, the weather, her landlord and/or her husband. Me forgetting either my phone, keys, lunch or tea, requiring me to come back into the house and therefore receive another round of good-bye hugs and kisses. If my hubby is almost ready to leave as I'm heading out the door, I usually wait and drive him to the subway station. It is, after all, one of the few moments we get to spend alone together during the day. I'm working to find solutions to these problems. I usually spend some time thinking of ideas while I'm stuck in traffic. But I sometimes wonder: do I have some inner, natural resistance to leaving the house each day; a subconscious desire to stay at home? So, I'll keep trying to make it out the door before 7:45... Question is, how will I reward myself if I ever successfully manage to Beat-the-Clock? Just getting myself dressed now. I really love napping. It is a great escape that allows me to recharge. It’s not just that I need a break; I really believe in the importance of a siesta. True, sometimes my naps last as long as 2 hours, depending on how long the children are asleep, but I don’t feel guilty. I justify the duration of my nap by acknowledging that my body must really have needed the rest, right? Besides, a good nap is so important to my state of mind. One of my mantras is everything is easier with patience. (Yes, even squabbling children, sassy mouths and tantrums.) And patience is severely limited by exhaustion. So, since weekday naps are not looked upon fondly at the office, weekend naptime is sacred. Even big sister who has outgrown napping gets some quiet time (also known as TV) so that mom and dad can rest too. And I am grateful for hubby, who usually makes sure I get at least a catnap on the weekends in return for letting him sleep in. In spite of my great regard and recognition of my sometimes desperate need for a nap, I sometimes still struggle with whether or not I should take one. Another one of my mantras is do what you can when you can. Although napping can fit into this guidance as take-a-nap-when-you-can-get-a-nap, it also conflicts with the general principle of efficiency. Think of it, at least an hour and a half of almost uninterrupted time to get some exercise, do grocery shopping, wash windows, read a book, dust, assemble a baby book, catch up on missed television shows… if I were to give up my weekend naps for a period of two months or so, think of how much I would accomplish. The Never-Gets-Done List might become obsolete. And yet, after making it through a weekend morning, my bed looks oh so inviting. Alas, it seems that eventually, this inner conundrum may be resolved for me. Now that our second little girl is 4, the signs are evident that she is on the verge of giving up her afternoon nap. And the likelihood of having the two sisters quietly entertain themselves for even a catnap-length of time is low. Squabbling is bound to occur. I had a great Mother's Day. I had a fantastic run, a nice brunch, a wonderful nap, and a lovely pizza picnic with ice cream for dessert. However, it didn't matter so much what I did today that made it nice; it was more about how I felt. For the past two days, I didn't feel like a very good mom. I was exhausted, I was trying to do too much, and I was very irritable and grumpy. The girls were challenging and difficult, and I'm embarrassed to admit it, but I yelled some. I used my mean mommy voice too often. I wasn't proud of myself. But today, after some time doing things for myself, and a really good nap, I've realised that I just need to give myself a break. Not in the take-the-day-off, go-for-a-pedicure, or let-someone-else-mind-the-kids kind of break. These would be nice too, and I'm sure that these would be lovely Mother's Day gestures received by many moms today. But I'm talking about giving myself a break by easing up on myself, and lowering my expectations a little. I will accept less than perfect behaviour from myself and my children. I will remember that they are little and that they need hugs and comfort more than strict discipline. I'll make sleep and rest a priority so that I don't pass the threshold of grouchiness. I'll try not to be bothered by toys not put away in their proper place, unswept floors, and unfolded laundry. I'll let the girls paint their toenails with chalk and dig in the dirt. I'll try not to be so bothered when they talk back to me or throw a tantrum over some ridiculous request. I'll put off the grocery shopping, the clothes sorting, the vacuuming and the mending. I will accept that these are crazy and challenging and difficult times, but remember that childhood only lasts a short while and when it's gone, I will miss it. I'll remind myself that what's most important is that my children are healthy and happy and loved. It's not always easy to give myself a break, but I'm sure that my family and I will be much better for it. Certainly today, taking a deep breath and remembering these things helped all of us enjoy a very nice day. Last week, Middle turned 4. She was very excited. But still quite pragmatic. On the day before her birthday, when I told her that this was her last day of being 3, she corrected me. “No, this is my last day of being 3 and a half.” It’s important that she be as big as she can be. Maybe I should call her the big-little sister instead. I really like making birthday cakes. And as a working mom, I kind of feel that I should really make the effort to make a homemade cake for events as important as my children’s birthdays. Like I owe it to them. Maybe it’s also because I’m part of the Martha Stewart generation, and I feel compelled to do things from scratch, even if it causes me some stress. But mostly, making cakes is fun, and it helps me feel like I’m managing to balance everything without cheating. Plus, it’s one of those ‘you’re such a mom’ things that I do. When Oldest turned 1, I made a baby friendly carrot cake from a baby cook book. I felt quite virtuous about it, but it wasn’t very good. The next 1st birthday cake was chocolate, but still homemade. By baby number three, the number 1 candle was plunked in the middle of a store-bought cake. When Oldest wanted a princess cake from the grocery store when she turned 5 last September, although I felt a little disappointed, I also obliged without protest. It might be a little less satisfying for me, but buying a cake is so much easier. Back to Middle's 4th birthday cake: we had been talking about and planning her birthday cake for weeks. First, she wanted a chocolate cake with pigs on it, like they were playing in the mud. (Cool, I thought – that could be both easy and fun!) Then, it was a white cake with flowers around the edges. (Sounded like a store-bought cake to me.) And for a while, I thought for sure I was going to be making another castle cake. The first castle cake came when Oldest turned 3. I did a lot of Google research looking up “how to make a castle cake”. Some of the cakes I found were beautiful, but also quite elaborate and complicated. I prefer to go for simple and easy. So I skipped covering the ice cream cones with chocolate, and stuck to a single layer. 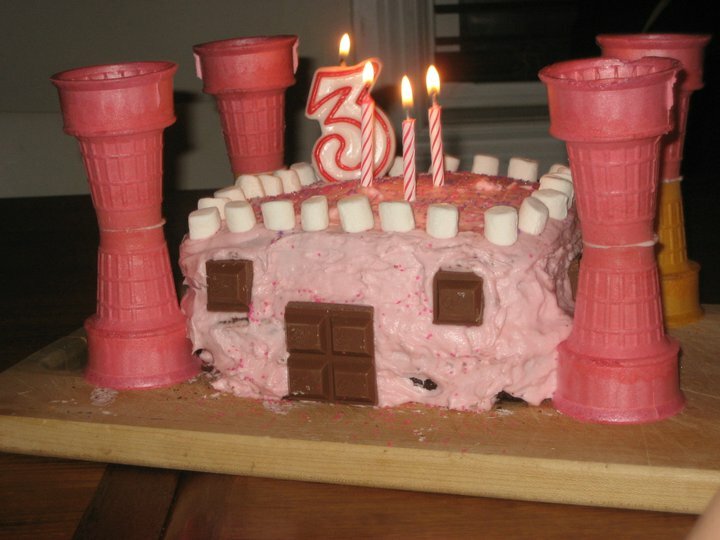 But pink icing, chocolate windows, and marshmallow parapets were very important. It was obviously a hit because the castle cake returned for the 4th birthday of Oldest, and the 3rd birthday of Middle. I was afraid that I might be making it for Youngest's 2nd birthday too, but I managed to talk her into a bunny rabbit. Middle also talked for a while about a doggie cake for her 4th birthday. Then, out of the blue, on the day before her party, she decided she wanted a Dora cake. (Dora? We hardly even watch Dora.) I thought this would mean that I would have to surrender to another store-bought cake. However, when I checked it out, the Dora cake in the grocery store was fancy, but I wasn't sure that our families would appreciate the fluorescent green and orange icing. In the end, it was a homemade cake with Dora cake toppers (thank goodness for the Bulk Barn!). Definitely no work of art, but Middle was happy. I was all set to write about birthday cakes, until I heard on the radio this morning about the dozen or so parents who lined up all night for registration for six coveted day care spots at a subsidised child care centre in a school in west Toronto. Are the parents crazy? Would I do the same thing? Yeah, I would probably line up for hours, even overnight if it meant getting a guaranteed spot for my kids in a licensed child care centre. Especially if it was a child care centre located within the school, and definitely if it was a subsidised child care centre. But would I line up for hours, overnight if it meant I was only going to get on the wait list? Probably not. The trouble with wait lists is that they’re not really about waiting. At least for child care centres, in my experience, wait lists are not simply a virtual line-up of people waiting their turn for the next available day-care spot. The administrators may be waiting, but as a parent, you need to be proactively managing your place on the list. You have to play the game. Call persistently. Make your presence known to the child care centre administrators. Call again and again. Bring cupcakes to the child care centre. Keep calling. It certainly isn’t a fair system. Now, I know that life isn’t fair. But when I think about the system for licensed child care in Toronto, I get upset and angry and frustrated. When our oldest was born, we were warned by neighbours to start calling day-care centres as soon as possible. By the time she was about four months old, I think I had her name on two or three different child care centre wait lists. In the five plus years since, I only ever heard back from one of them. I wasn’t playing the game. Since no spots were available by the time I went back to work, we went with a licensed home care system. Then, we were expecting again. This time, I called to put both Oldest and baby on the wait list for our preferred child care centre right away. Plus another day-care centre for Oldest. When I returned to work after this maternity leave, baby was in the child care centre, but there were still no spots for Oldest. We trekked back and forth between the child care centre and another licensed home care for 4 months until Oldest got a spot in the newly expanded preschool room of the child care centre. By this time, baby number 3 was on her way. And here’s where it gets complicated. Of course, baby number 3 was put on the wait list almost as soon as I knew I was pregnant. But with Middle and Oldest, what would we do? We certainly couldn’t afford to pay for child care while I was on maternity leave. But that meant sacrificing their spots, and going back to the dreaded wait list. This time around, I had also gotten wise to the separate wait list for child care fee subsidy offered by the city. However, keeping up with two separate wait lists could turn into a part-time job. Nothing has ever come of the subsidy wait list. Needless to say, there wasn’t a spot for them when I returned to work last March, and so we employed a nanny. Since having all three in a child care centre would have been cost-prohibitive while Youngest was an infant, using a nanny has at least been a more economical and convenient alternative, even if it wasn’t my preference. But now that Youngest will be a pre-schooler herself in September, we’re hoping that our seemingly perpetual wait list presence will pay off for us. So we started with emails to the administrator in March and April. Now we’ve moved to phone calls, which are all but embarrassing as I try not to grovel, but just attempt to ascertain our chances. “Hi, my daughters are the wait list for September, and I’m just calling to find out where we are or if you think there will be spots for them.” “It’s too early to determine occupancy for September. Try calling again in late July or August.” Is the administrator just placating me? Can’t she give me any insight at all? And so, I’ll call again next month, and then maybe move to a bi-weekly schedule. I haven’t moved on to cupcakes yet, but I might. I just might. I really am just an average working mom. I’m not in management. I don’t have hundreds of emails in my inbox every day. I don't spend my days in back to back meetings. I don't often find myself working late at night or travelling away from home. But even as an average employee, finding balance with family life is hard. Like many, I've always been fascinated by the lives of the important and powerful. Lately, with talk of surtaxes in Ontario for individuals who earn more than $500,000 a year, and the Ann Romney/Heidi Rosen-renewed mommy wars in the US, I've become even more intrigued with the career paths and daily lives of the highly successful. The government officials, the top executives, the big wigs. How do they get there? How do they do it? Do they have children? How on earth do they manage? Can they really balance family and career? I recognise that some very talented people excel in everything they do. These exceptional people are highly respected at work, run marathons, chair volunteer committee, regularly make gourmet meals, decorate gorgeous cookies for hockey team fundraisers, and design elaborate costumes for Halloween parties and dance recitals. So perhaps the highly successful CEOs, and political leaders with children are the type of highly intelligent, passionate, driven, and well-connected individuals who excel in everything. Perhaps they can be both important and powerful at their jobs, and also be wonderful, caring and attentive parents. They just probably never sleep. However, I imagine that there must be more to being both a parent and highly successful in your career than simply being exceptional. I mean, even the exceptional can't possibly be weighing big decisions which affect whole populations while watching their son chase a soccer ball, or deciding on the investment of millions of dollars while listening to their daughter whine about what skirt she wants to wear. It isn't really possible to do it all, is it? I've heard two different answers when I ask the question: "How do they do it?" The first is, they don't. The second is, they just do. So if it isn't truly possible to do it all, these powerful executive parents must have amazing support networks. Partners and families, for sure. And I guess that once a certain pay-band is acquired en route to the top, live-in nannies, cleaning staff, cooks and chauffeurs are employed which allows additional focus on work and further career development. Maybe then, they can sleep. But if they really are doing it all, how well are they doing? At some point, something's got to give. Unfortunately, I suspect that for most highly successful moms, it's the me-time, the chance to relax, regroup and be herself that is lost. And I'm sure they don't ever sleep. Maybe the 'they do' and 'they don't' responses are just a matter of perspective. In the pull between family and work, for the high-powered executives and leaders, the priority must be toward the job, right? The work-life balance can't really be so balanced. And I guess that's a decision that gets made somewhere along the career path. Whether its made by or for them is probably another matter altogether.Sheryl Sandeberg, COO of Facebook recently shared that she makes it a priority to leave the office at 5:30 each day in time to have dinner with her kids. Although one has to believe that she also does a lot of work in the early morning and late at night to compensate. However, she suggests that it is possible to have a highly successful career and a balanced family life. She advises that a strong support system (i.e. a husband able to share the responsibilities) and having a well established job and career path before starting a family have enabled her to manage. I'm still not convinced that she sleeps very much. Although I sometimes think about furthering my career, or 'getting ahead', I'm certain that I'll never be a highly successful, powerful executive. And I'm certainly glad that as an average working mom, my biggest decision of the day is usually "What am I going to make for dinner?" And usually, I manage to sleep.